Terry, who was recently named the new artistic director of Shakespeare’s Globe, crops up throughout Angela Thirlwell’s new book Rosalind: Shakespeare’s Immortal Heroine. This “biography” of Rosalind contains interviews and insights from Juliet Stevenson, Janet Suzman, Vanessa Redgrave, and others who have acted in or directed As You Like It, but it also explores the character’s literary antecedents and descendants, key turning points in her “life,” and her enduring appeal. “As You Like It was entered on the Stationers’ Register in London on 4 August 1600 and was probably written in 1599 or early 1600. So it may have been one of the opening productions – or even the very first show—at Shakespeare’s new Globe Theatre. On the other hand, his company, the Chamberlain’s Men, may have premiered As You Like It at the Curtain Theatre in Shoreditch, north of Thames, before they crossed the river and erected the Globe on London’s Bankside 1 However, after these speculative but unconfirmed first performances and a shadowy sighting of the play in the presence of King James I at Wilton House in December 1603, its performance record mysteriously goes dark throughout the whole seventeenth century. It didn’t even surface when the theatres were re-opened and actresses allowed onstage after the Restoration of the monarchy in 1660. When Charles Johnson first revived As You Like It under a new title of Love in a Forest in 1723, it was a travesty of Shakespeare’s text, excising Jaques and Touchstone as well as the rustic shepherd classes, and stealing Pyramus and Thisbe from A Midsummer Night’s Dream. The play was more accurately restored at Drury Lane in 1740 when Hannah Pritchard’s Rosalind in her daring breeches caused a sensation. Thomas Arne’s settings for the songs became an essential factor in As You Like It’s fresh and continuing popularity. Arne not only composed settings for ‘Under the Greenwood Tree’ but also for ‘Blow, blow thou winter wind’, whose uncompromising view of human nature and man’s ingratitude challenged the pastoral ideal implicit in the earlier lyric. Stoical in the face of many emotional and professional losses, Ford Madox Brown, the Victorian painter, chose ‘Blow, blow thou winter wind’ as his favourite song. Brown was an avid theatregoer and in 1848 he saw Laura Addison cross-dressing as Viola in Twelfth Night at Sadler’s Wells. I like to think he may have seen one of the great Rosalinds of the Victorian age, ultra-feminine Helen Faucit, androgynous Ellen Tree, or mannish American, Charlotte Cushman. In 1872 Thomas Hardy borrowed one of As You Like It’s songs for the title of his pastoral tale, Under the Greenwood Tree, his only work with a happy ending. J.M. Barrie called it Hardy’s ‘most perfect’ novel. I suspect it appealed to Barrie because its exploration of time passing in an already out-dated rural world paradoxically ensured its very timelessness. If one of the chief attractions of playing Rosalind is the chance to defeat time and be young forever, I wonder if J.M. Barrie knew about Ellen Terry’s longing to play Rosalind, one of the few great Shakespearean roles for women she had missed? Because in 1912 when she was sixty-five and he was fifty-two and both undeniably middle-aged, he wrote Rosalind a one-act play about a successful but mature actress called Beatrice Page who has been twenty-nine forever. 2 Barrie’s choice of the name Beatrice suggests his homage to Ellen Terry’s stage triumph as the heroine of Much Ado About Nothing, as well as underlining Beatrice’s sisterliness with Shakespeare’s Rosalind. Ninety years later Barrie’s play Rosalind was broadcast on radio with Judi Dench as Beatrice Page. ‘Her voice breaks; no voice can break so naturally as Beatrice’s,’ says Barrie’s stage direction, which although he couldn’t possibly have known it, is a perfect description of Judi Dench’s distinctive vocal register. In Rosalind Barrie unraveled some of his favourite themes: the fantasy nature of acting and the treachery of ageing. Beatrice Page, ‘forty and a bittock’, has retired to a seaside resort to relax in unstructured clothes and try on middle age for size. She rather likes middle age. So she’s disconcerted when a young admirer arrives unannounced. Charles Roche discovers his adored ‘Rosalind’ is in fact a faded palimpsest of his effervescent stage heroine. The photograph on the mantelpiece that Mrs Page refers to as her daughter, is of herself, made-up and dazzling in her finest role – as Rosalind. CHARLES For ever young is Rosalind. The play ends as the train whistle blows and Beatrice Page prepares for a new life. She banishes middle age with the technical skills of her acting and embodies again the eternal summer of being Rosalind. Like Barrie’s Peter Pan, Rosalind can never grow old. But unlike Peter Pan who is embalmed in childhood, Rosalind reaches full and free emotional maturity. She educates her lover Orlando in the university of love to become her rightful equal. True, Rosalind will never age like Wendy Darling who grows up to look ancient in Peter’s appalled view. Wendy has to be left behind while he goes on playing, stuck as boy eternal flying back to the Neverland. Rosalind, on the other hand, finally quits the forest of Arden to enter marriage, enlightened and on her own terms, as she’s negotiated with Orlando. With her experience of truth telling in the forest, she will take her place in adult society. For Rosalind, marriage is not just an end, but a beginning. We can be sure the conversation will continue. In his own life Barrie married an actress, Mary Ansell, who always dissembled her real age by about a decade and eventually ran off with a much younger lover. Barrie wrote Rosalind soon after his marriage fell apart. He tended to fall in love with his leading ladies, although his relationships with women were probably stalled in childhood where he felt most at home, with Peter Pan and the Lost Boys. They had banished growing up. It wasn’t altogether surprising that in his eighties Barrie was once more smitten with youth. He fell in love with Elisabeth Bergner who starred as Rosalind – with Laurence Olivier as Orlando – in her husband’s Paul Czinner’s 1936 film of As You Like It. Barrie’s long involvement with immortal Rosalind was complete when he suggested treatment for the film and became adviser to the director. 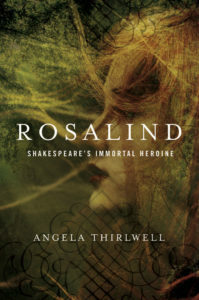 Excerpted from Rosalind: Shakespeare’s Immortal Heroine by Angela Thirwell, published by Pegasus Books. © Angela Thirwell. Reprinted with permission from the publisher. All other rights reserved. This suggestion from Lois Potter, The Life of William Shakespeare: A Critical Biography (Oxford: Wiley-Blackwell, 2012), p. 235. Published in The Twelve-Poung Look and other plays by J.M. Barrie, (London: Hodder and Stoughton, 1921). Broadcast on BBC Radio 4, 3 June 2002. Information from Eileen Page who took the part of Beatrice Page at a rehearsal reading of Rosalind at the Park Theatre, London, 11 October 2015. Eileen was taught at RADA by Irene Vanbrugh who first played Barrie’s role and remembered Ellen Terry.